A common misconception is that lead acid batteries cost less than lithium-iron phosphate batteries. 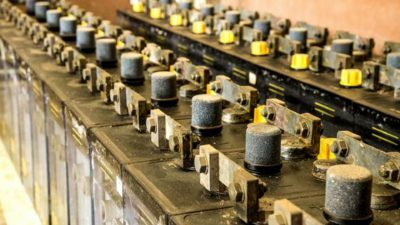 However, what most fail to consider is that you have to buy many more lead acid batteries — sometimes double, triple or quadruple as many — just to reach the same usable capacity as you would achieve with far fewer lithium-based batteries. How many of these will you need to size a job properly for its lifetime? The misconception is largely due to battery manufacturers touting their total rated or nameplate capacity, which is the kWh the battery is theoretically able to store. You have to dig deeper to find a battery’s actual, usable capacity — which is the kWh the battery is able to store after factoring in depth of discharge, efficiency and charge/discharge rate restrictions. In layman’s terms, nameplate versus useable capacity is not unlike your annual salary versus your actual take home pay after taxes, social security, health care and other expenses have been deducted. In theory, your offer letter says you will earn $50,000 annually, but your paychecks only deliver a usable $32,500. Depth of discharge, efficiency and charge/discharge rate not only directly impact the number of batteries that must be purchased up front, they also significantly impact the Levelized Cost of Energy, or the overall cost per kWh associated with a battery over the course of its lifetime. When trying to determine which battery is most cost effective, it’s essential to review the allowable or more important, Warrantied depth of the discharge. You can often find this information listed as part of a battery manufacturer’s Warranty or product data sheets. Let’s say you are trying to decide whether to go with 10 kWh total storage capacity of lead acid batteries vs. 10 kWh of total storage capacity of lithium batteries. Since lead acid batteries often can’t be discharged (used) more than 30-50% of their total rated capacity at a time (i.e., their state of charge cannot go below 50%) and lithium batteries can often be discharged 80-100%, this results in significantly more available energy for the lithium battery and much less usable capacity for the lead acid battery bank. Before factoring in efficiency or charge/discharge rates, it’s already necessary to purchase double the lead acid batteries to approach the usable capacity of the lithium battery bank, despite both banks having the same rated 10 kWh capacity. Roundtrip efficiency is the ratio of energy put into a battery versus the energy that comes out of a battery. No battery is 100% efficient because there are always some inefficiencies between the amount of energy sent into the batteries vs. how much energy can actually be used (i.e., is not consumed by the battery during the charge and discharge process). Lithium batteries generally have much higher efficiency than lead acid batteries, which again directly impacts the amount of usable capacity, as demonstrated below. Therefore, in addition to depth of discharge reducing usable capacity, roundtrip efficiency rates further reduce usable capacity to varying degrees. After factoring in both depth of discharge and roundtrip efficiency in the above example, the lithium batteries have almost four times higher usable capacity than the lead acid batteries, despite having the exact same 10 kWh nameplate capacity. In other words, you would need to purchase 4x as many lead acid batteries as lithium batteries to reach the same usable capacity. Beyond depth of discharge and roundtrip efficiency, be sure to consider cycle life, or the number of charge/discharge cycles you can get out of a battery over the course of its life. Consider this calculation of Levelized Cost of Energy (LCOE). When evaluating which energy storage solution is best suited for your next project, it’s important to consider the full range of data specifications needed to determine the overall performance and cost of the battery over time, not just the often misleading upfront price point and assumed performance of the published nameplate capacity.